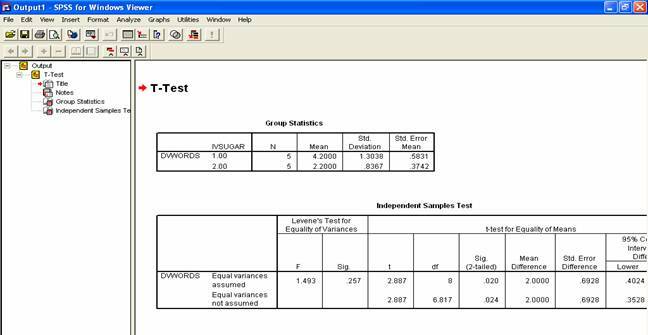 How do I analyze data in SPSS for an independent samples T-test? 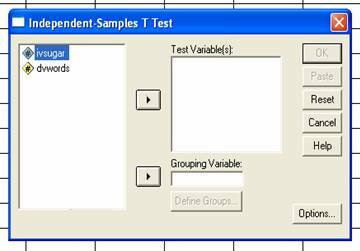 Home > How do I analyze data in SPSS for an independent samples T-test? We are going back to the Analyze menu. 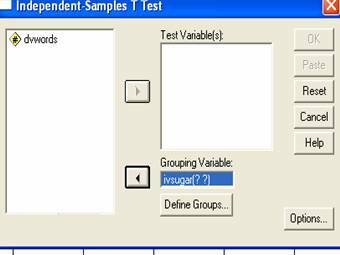 Click Analyze, click Compare means and then Click Independent Samples T Test. This will appear. You will see your variables in the box on the left. Your goal is to get both variables over to the right. You want the IV to go to the “Grouping Variable” box. To accomplish this, first highlight the IV by clicking on it. 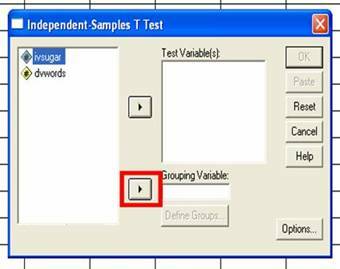 Next, click the arrow button next to the grouping variable box. Your IV should move. 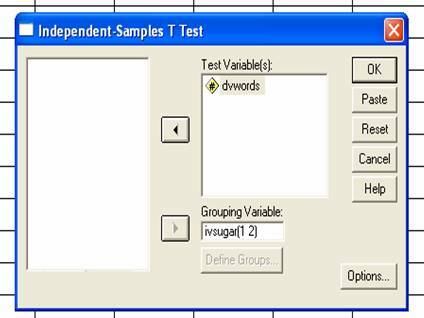 See ‘ivsugar’ in the test variables box below? Next step is to click the Define Groups Button. 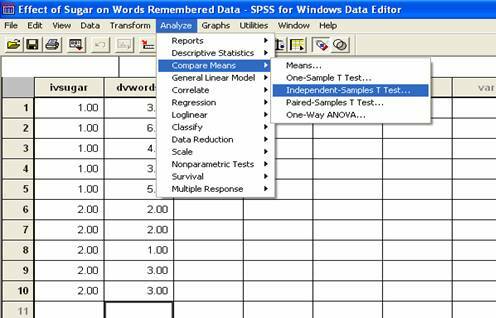 This button will help you tell SPSS what the numbers you chose for the IV column stand for. A tiny Define Groups Box will appear. You want to fill in the blank for the empty box next to Group 1 and Group 2. SPSS wants to know two things here. What number did you use to represent Group 1 in the data file? That is, what number did you use to represent the first condition? 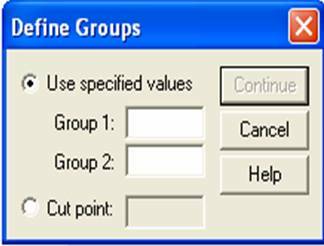 Also, what number did you use to represent Group 2 in the data file? That is, what number did you use to represent the second condition? In our example, we used a 1 to represent our first condition. So, I will type in a number 1 in the empty group 1 box. We used a 2 to represent our second condition, so I will type in a number 2 in the empty group 2 box. This is how it should look. Click the Continue button when you are finished. 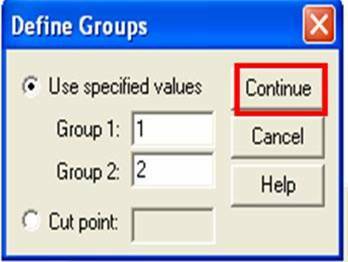 After defining your groups, you will go back to the box you had been working in. You have already moved the IV to the appropriate place. Now it’s time to move the DV. You want to move the DV to the Test Variables box. To do this, click on the variable name to highlight it. 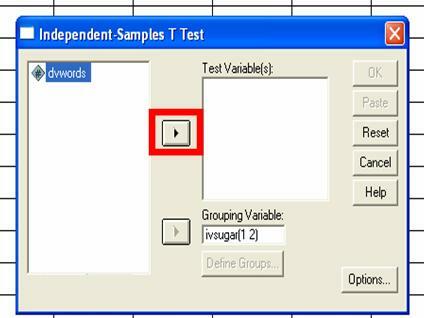 Then, click on the arrow button that is next to the Test Variables box. You should see something like this. 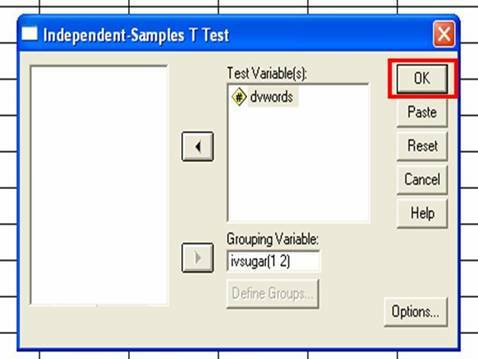 Your DV should appear in the Test Variables box. You are all finished with Analysis so click the OK button. Your computer may take a few seconds to process the results. It may look like the computer is frozen. Just give it a few seconds to do its work. Your results will appear in an output file. Remember, this file is something separate from the data file. It will probably look something like this. Make sure you save your results to a meaningful place and with a meaningful name. You can do this by clicking File and then Save or Save As. I will choose the name “Effect of Sugar on Words Remembered Output.spo” This name makes it easy for me to remember the experiment and helps me to see that these are the results (output), not the data.